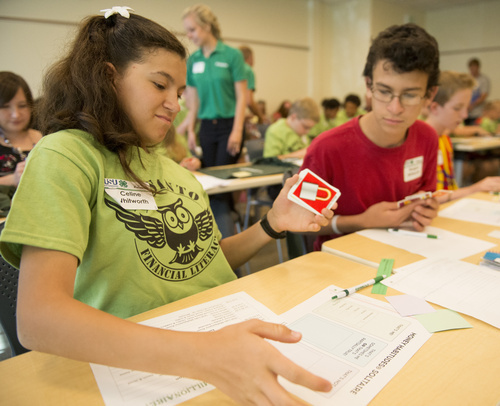 Education • Teens share their financial training with peers as part of summer program. American Fork • When the heat takes over and school&apos;s out for summer, many kids long to spend the day splashing carefree in pools. 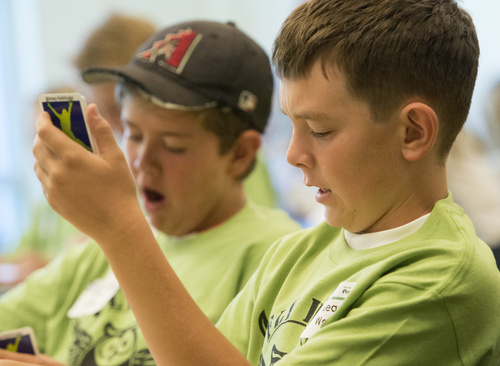 More than 50 Utah County teens, however, chose a different diversion this week: learning financial literacy in an air-conditioned, corporate conference room. "I actually wanted to come because I wanted to learn about how to save my money," said Gabriela Pedroza, who will be a freshman at Provo High in the fall. "In the future, if you want to go to college, you can use that money." 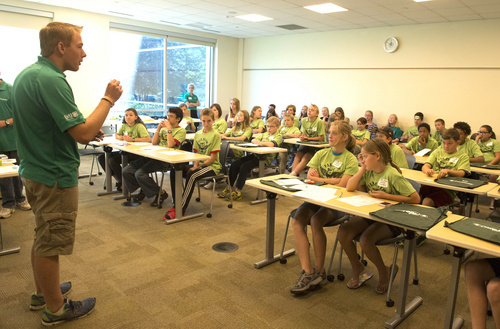 Though Utah already ranks high when it comes to financial literacy, Fidelity Investments and Utah State University (USU) Extension 4-H launched a new Money Mentors program this summer to try to boost that knowledge even further. 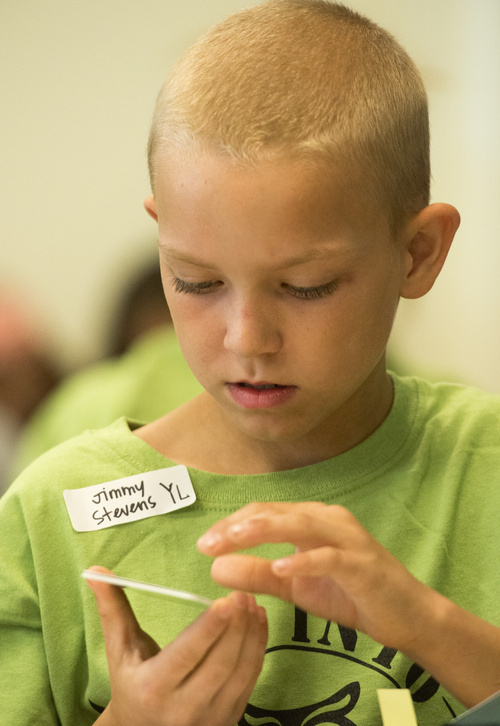 In May, more than 60 Utah teens from 11 counties trained in the subject, and this summer, they&apos;re teaching their peers across the state what they learned. Program leaders expect to reach at least a few hundred kids this summer. 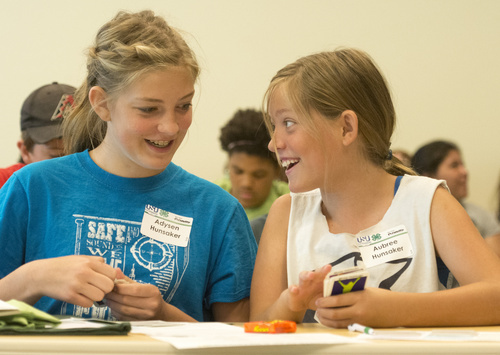 "The idea of being able to impact kids when they&apos;re young and make smarter financial choices early is what&apos;s going to make a difference long-term for these kids," said Dave Francis, USU extension associate professor. Utah already requires students to take a financial-literacy course before they graduate from high school  part of the reason WalletHub ranked the state No. 2 in the nation for financial literacy earlier this year. The governor also signed a bill this year aimed at improving the state&apos;s high school financial-literacy course by creating an online, end-of-course assessment and providing more training opportunities for teachers, among other things. But Francis said Utah kids are still not as financially literate as they should be. He said the program&apos;s model of using teens to teach kids may help some students who don&apos;t otherwise warm to the traditional high school course. "Sometimes, for a variety of reasons, kids don&apos;t thrive in a high school environment," Francis said, "but sometimes in an outside, informal setting, they may do better." 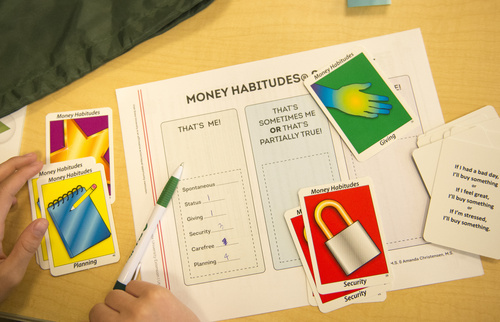 On Monday, the Utah County kids spent about six hours playing games and participating in activities designed to teach them how money works. They learned relatively simple concepts such as the difference between wants and needs. And they learned more advanced ones  some of which might be news to many adults  such as the Rule of 72. The Rule of 72 states that when it comes to investing, one can learn how many years it will take to double one&apos;s money by dividing 72 by the expected interest rate. For one activity, the teen leaders gave the kids worksheets listing spending choices and beans with which to mark those choices. Some options, such as eating out and buying new cars, cost more beans than others. Kids had to choose how to spend their limited beans. For another activity, the teen leaders asked kids to use pie charts to show how they would spend $100. They then shared their charts. 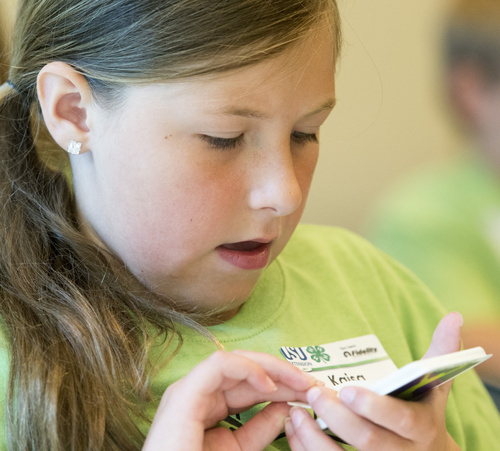 River York, who will be a fifth-grader at Provo&apos;s Provost Elementary, raised her hand and explained that she chose to spend $20 on herself, $20 on food, $20 on clothes, $20 on savings and $20 on school. Teen leader Jerod Boley, who will be a 10th grader at Saratoga Springs&apos; Westlake High, told her that was a great answer. Boley, 15, and fellow teen leader Devin Bunnell, 13, said most kids don&apos;t know as much about money as they should. "They know common sense, but they don&apos;t know facts like the Rule of 72 or how credit works," said Bunnell, who will be an eighth-grader at Lindon&apos;s Oak Canyon Junior High in the fall. "It always helps to fully understand and prepare for the future." 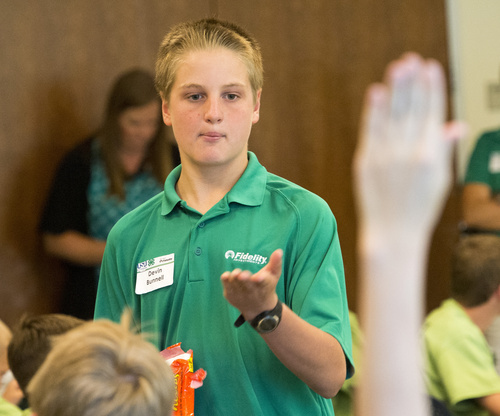 The teen leaders recruited the kids they taught Monday, many of whom are also in 4-H. Some of the kids acknowledged their parents signed them up, and the class wasn&apos;t their idea of a perfect summer day ("It&apos;s just like school," said Sean Walker, 12, of Oak Canyon Junior High). But others said they were eager to learn more about finance, even if it meant giving up a day at the pool. "I thought it would be fun," said Makaela Ostermiller, 14, of Vista Heights Middle School in Saratoga Springs. "I&apos;m getting ready to start getting a job, so I thought this would be a good idea to get an idea of how to use my money." Teen leader Richard Whitworth, 18, said he enjoys teaching younger kids about money, and he&apos;s learned a few things himself in the process. He said, for example, he learned more about the stock market and investing in oneself. Whitworth hopes the lessons help the younger kids for years to come. Washington • The United States runs in the middle of the pack when it comes to the financial knowledge and skills of 15-year-old boys and girls, according to an international study released Wednesday. China&apos;s financial hub of Shanghai had the highest average score for teens who participated in the 2012 testing for the Paris-based Organization for Economic Cooperation and Development. A total of 18 countries and economies were studied in the program&apos;s first assessment of financial literacy of teens. Shanghai was followed by the Flemish Community of Belgium, Estonia, Australia, New Zealand, the Czech Republic, Poland, Latvia, the U.S., Russia and France. 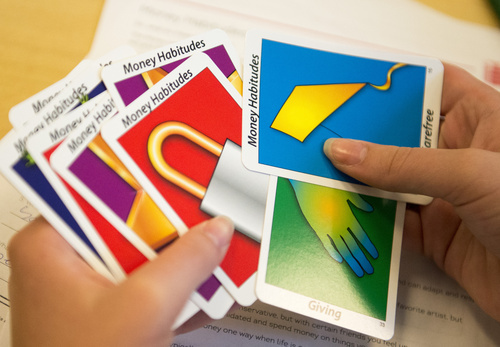 The easiest questions asked students to display basic financial literacy skills, such as comparing prices per unit to determine which had a better value. The most difficult asked students to analyze more complicated scenarios, such as reviewing two loan proposals with differing rates and terms and choosing the better offer.